The best shows, movies, gifts and more this yuletide season. We want to know what you think. Click here to answer this week's poll question. Essential advice for our scholastically minded citizens. Never stop learning. There's no excuse not to go back to school. Events, discounts, and the best of Chicago delivered to your inbox every week. Win prizes and get discounts, event invites and more. Get free tickets to hot new movie releases. Who does what and why. Scrubs belts out its long-awaited musical episode. DON’T WANT NO SCRUBS Sarah Chalke and Zach Braff try it once more with feeling. It hasn’t always been easy being Scrubs: bumped around the schedule, never getting the network support it deserved, blithely ignored for Emmy nominations, and always somehow absent from discussions of the birth of single-camera comedies, even though it predates Arrested Development and The Office by years. But Scrubs creator and executive producer Bill Lawrence isn’t bitter. In fact, he’s singing. He’s crooning a few lines from Les Misérables in French, just to prove he still can, and to convince us all he’s a gigantic musical-theater nerd. But Lawrence needn’t have gone through the bars: Thursday 18’s musical episode of Scrubs, appropriately titled “My Musical,” suffices. Scrubs fans are used to seeing the cast sing, and yes, it’s really them singing on the episode. J.D. (Zach Braff) often sings during his daydreams; the hospital a cappella group makes frequent appearances; and in one memorable episode from the second season, “My Philosophy,” there’s a wrenching performance of a dying patient singing “Waiting for My Real Life to Begin.” This time, though, the songs aren’t through J.D.’s eyes, they’re through a patient’s. Scrubs prides itself on using real medical cases, and when the medical consultant for the show discovered a case where an aneurysm caused musical hallucinations, the writing staff found its story. (Curious? The journal article is called “Musical hallucinations associated with seizures originating from an intracranial aneurysm,” and it was published in the Mayo Clinic Proceedings.) When the patient’s around, everything is in song. What’s surprising about “My Musical” is that it’s a pretty straightforward episode. It’s flashy, sure, but it doesn’t deviate from the standard Scrubs model: J.D. meets a patient whose ailment becomes a metaphor for whatever personal issues he’s facing, and over the course of the episode, he realizes that he’s not the only one trying to make sense of the issue. In fact, every character is, in some way or another. There’s a breathless speech from Dr. Cox, some bickering between Turk and Carla, a heap of inside jokes between Turk and J.D., some high-strung neurosis from Elliot, mischief from Janitor, and so on. Just set to music. “My Musical” airs Thursday 18 at 8pm on NBC. No comments yet. Click here and be the first! Subscribe now and save 87%! For just $19.99 a year, you'll get hundreds of listings and free events each week, plus our special issues and guides, including Cheap Eats, Great Spas, Fall Preview, Holiday Gift Guide and more! 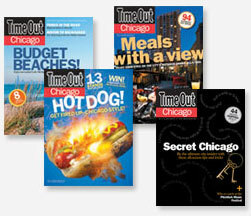 Time Out Chicago respects your privacy. We will only use your e-mail address in order to contact you regarding to your subscription and to send you our weekly e-newsletter. We will not share this information with anyone. The 40 creative icons who define the city of Chicago.